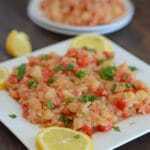 A tangy comfort food, side dish that pairs very well with any type of meat. 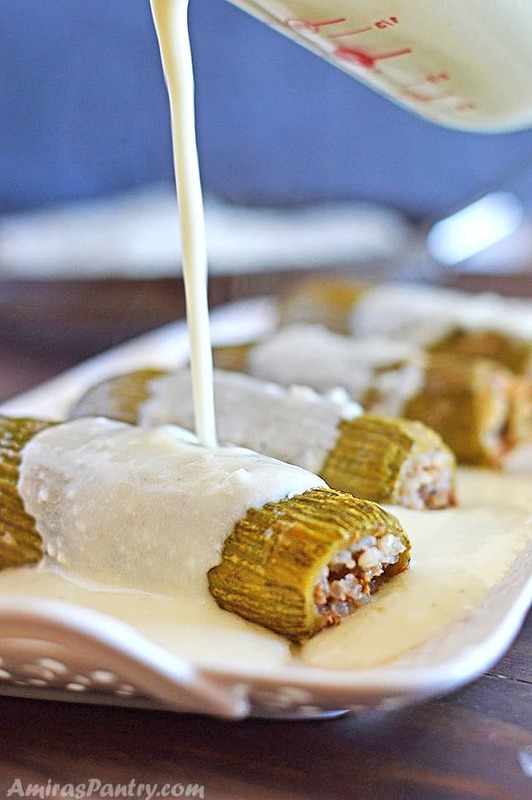 A Lebanese stuffed zucchini recipe that can be easily turned into a vegetarian meal. 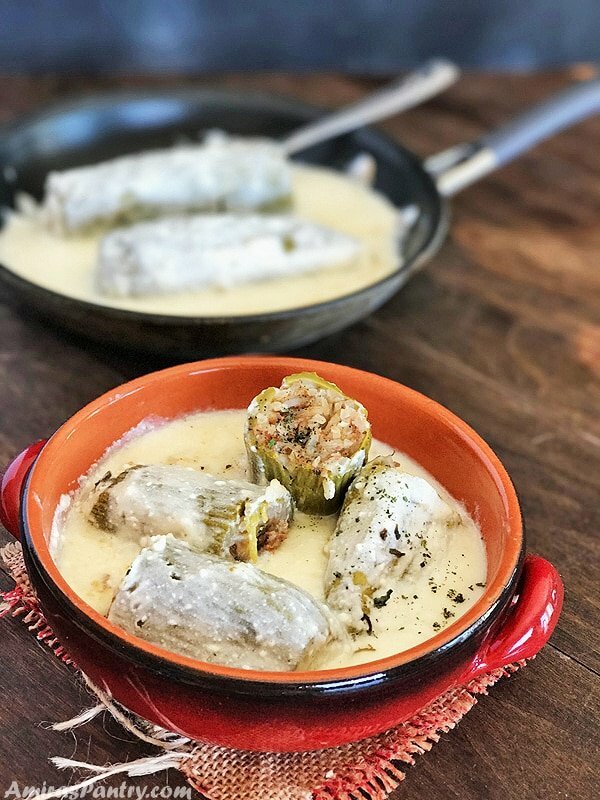 Kusa bel laban, kousa in yogurt or stuffed zucchini in yogurt sauce, is a delicious classic Lebanese recipe that I consider a variation to the traditional Mahshi, but oh so good. I’ve always had mahshi cooked the traditional way, cooked in tomato sauce. This was my first time having it swimming in a poodle of delicious yogurt sauce. In Egypt -and I believe all Middle Eastern countries now- you can find zucchini cored and cleaned wrapped neatly in packages and ready to be stuffed, aren’t women pampered there :). Anyways, it is not that hard to core zucchini but it will definitely make life easier if these packages were available here. The key to all Mahshi kinds, or as my mama told me, is a lot of fresh herbs. Parsley, cilantro, dill and mint. Here it is not easy to find the kind of fresh mint that I like, so I use dried mint. Fresh herbs are usually have more flavors than dried ones. If you cannot find fresh herbs at least use fresh parsley and cilantro. So let’s see how to make this delicious, saucy zucchini. 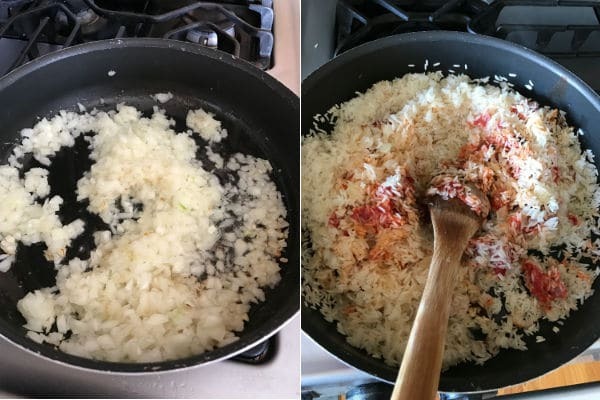 Saute onion in oil then add rice, tomato paste and spices. Stir to combine for a couple of minutes. Add minced beef, if using, fresh herbs and stir very well, turn off the heat. 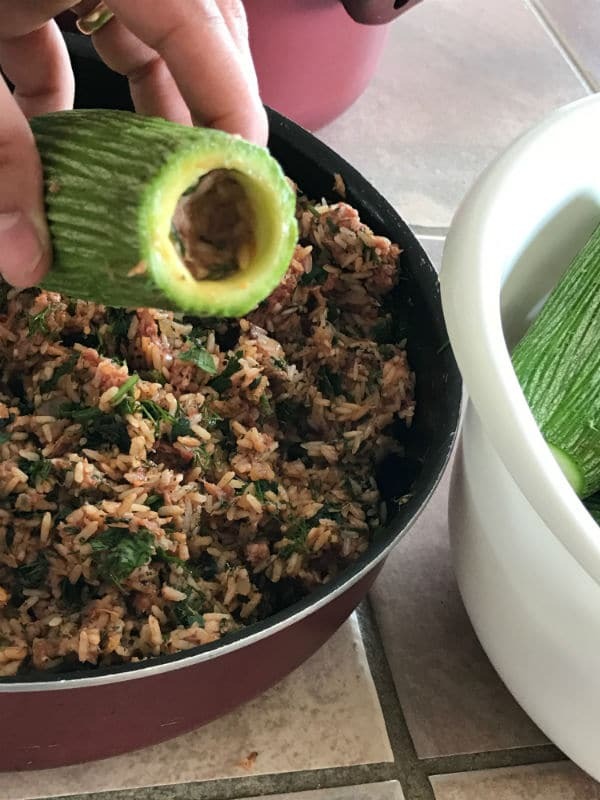 Now stuff the zucchini with the mixture, do not stuff till the top as rice will cook and expand. 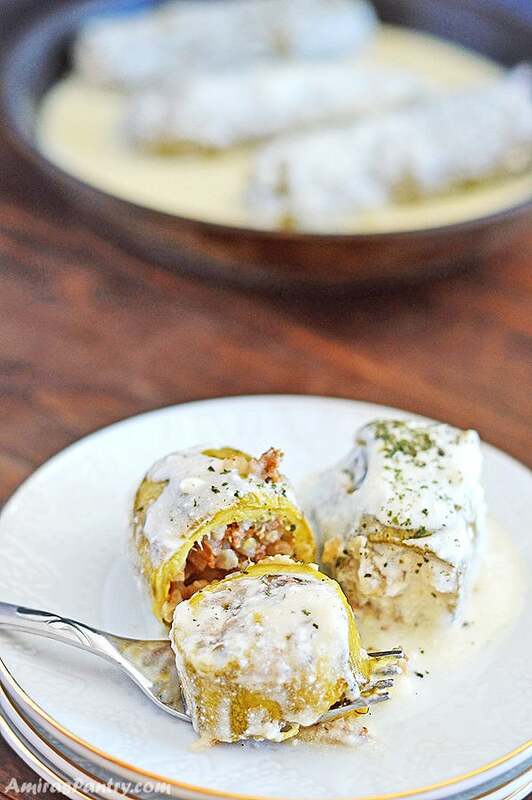 Arrange the stuffed zucchini to a pot, add water and cook the zucchini for almost 20-30 minutes. 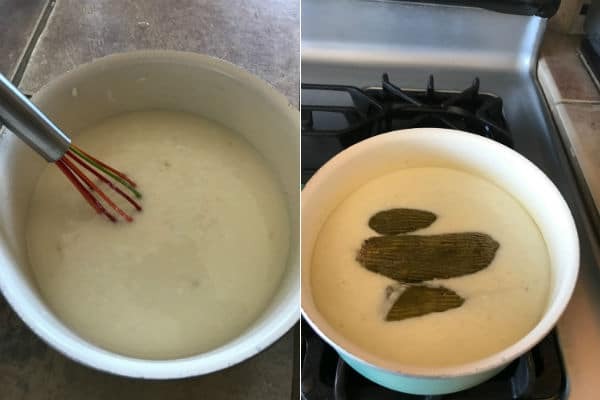 Meanwhile make the yogurt sauce and drop the partially cooked zucchini in the yogurt sauce and continue cooking until completely done. 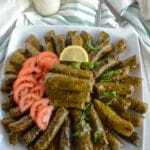 Serve warm with your favorite meat or for a meatless or vegetarian version you can omit the ground meat and use mushrooms instead.I do not usually add ground meat to Mahshi, but I’ve learned that authentically in Lebanon they do that, so I followed their tracks. I hope you’ve liked today’s recipe and give it a try… Until next recipe, have fun in the kitchen. 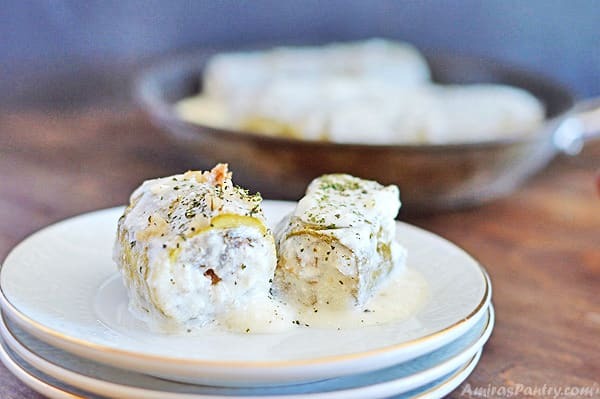 A delicious Lebanese stuffed zucchini in a tangy yogurt sauce. 1 large yellow onion , chopped. 1 cup parsley , chopped. 1 cup cilantro , chopped. 1/2 cup dill weed , chopped. Salt and pepper , to taste. 2 large garlic cloves , minced. 1 Tablespoon cornstarch , dissolved in 2 Tablespoons water. Wash, peel(if desired) and core zucchini. In a deep skillet, on medium heat, add oil and sauce onions until fragrant. Add rice and stir for a minute. Add tomato paste, stir. Add the spices , fresh herbs and meat, stir for a couple of minutes to combine then turn off heat. Allow to cool down. Add seasoned water/broth to the pot to fill it halfway through the zucchini. Bring to boil, reduce heat cover for 20-30 minutes, until it is almost done. In another pot, add all the sauce ingredient and mix well. Transfers the pot to the stove top on medium heat, keep stirring or it will curdle. 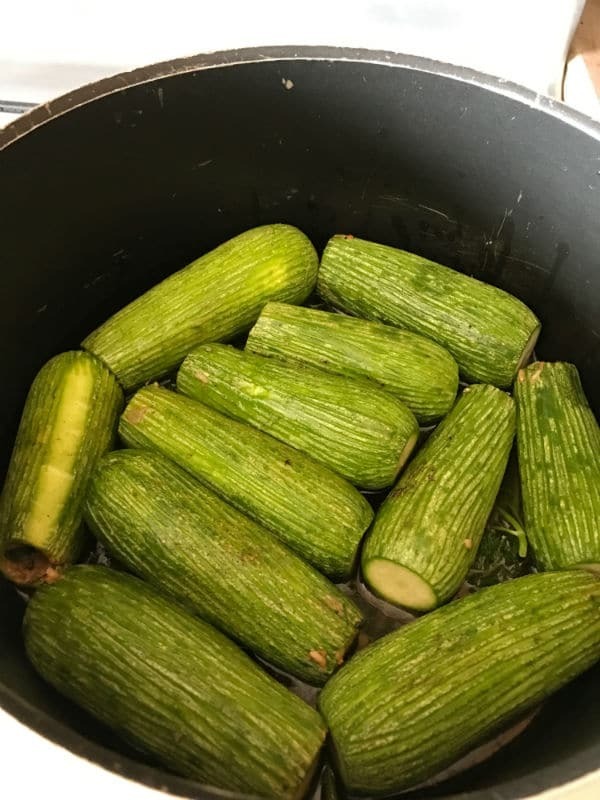 When it starts to boil, carefully drop the zucchini in the sauce, reduce heat and let it finish cooking about 10 more minutes. To prevent scorch, add some herbs in the bottom of the pot. Or you can add tomato or onion rings. 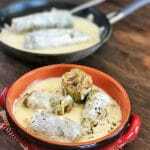 Previous Post: « Mothers day cake recipe; Roasted Powdered Milk Cake! 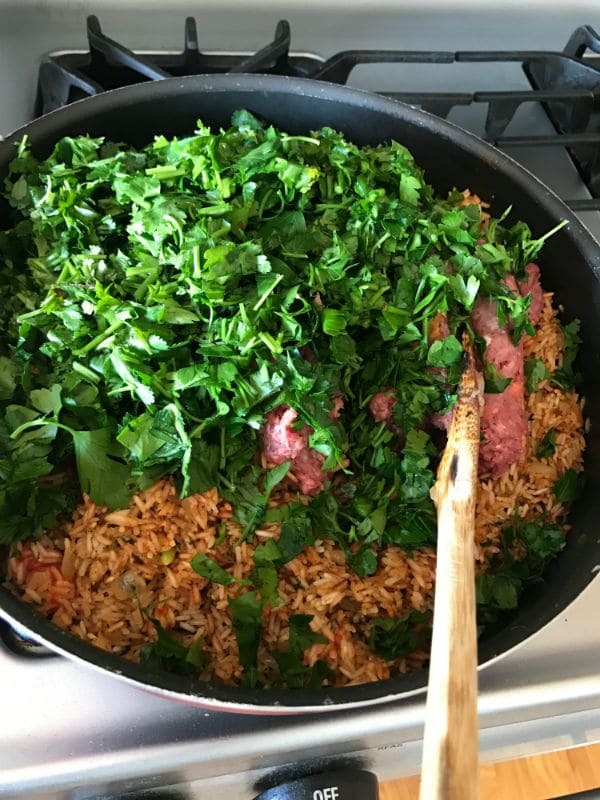 I can’t eat much rice, could I just use the meat only? Hanim, yes of course you can do so and omit the rice altogether.